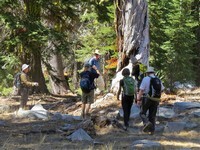 Seven of us took off for Northern California today to hike in the Trinity Alps. 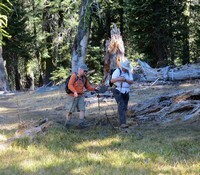 On our way, near Hilt, we saw all the fire damage from a summer fire in the area. Extensive burned areas but not many structures were involved. However, it was clear that the fire was on both sides of I-5. There was some light smoke in the air as we left Yreka on our way to Callahan, then headed up to the top of the ridge and down the other side a few miles to the trail head. 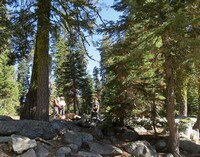 As we transitioned to the other side, the smoke left us entirely and it turned out to be a perfect day for a hike. This hike basically heads up one valley, past a beautiful lake, then up and across a ridge to the next valley, then down past another beautiful lake to the shuttle car. 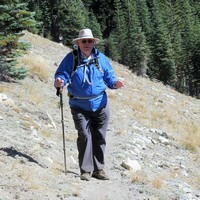 The hike is about 9 miles long and 2,000 feet of vertical, so nice, but at times - challenging. The trail has sections with big rocky steps and loose gravel, but great views. Lunch was taken on the ridge above the first lake (Trail Gulch) and we generally agreed that the next time we would take lunch above the second lake (Long Gulch). We were all tired by the end. On the way out we ran into a hunter who was heading into the back country with a heavy backpack, expecting to stay for awhile. Refreshments were taken by all at the Jefferson’s Roadhouse in Yreka. It was a full day and a great hike. Thanks to all for hiking with me.